“Woman of the Thirties” (1935). 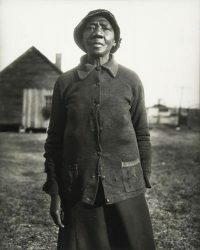 Photograph by Eudora Welty. On Friday, December 7 at 12:00, Dr. Michael Crews will lead a discussion of this remarkable short story in the Library Conference Room. Distance students and faculty are invited to join the discussion via Collaborate Ultra videoconference. First published in in 1941 in the Atlantic Monthly magazine, “A Worn Path” is available free on the Atlantic website. The story is only 3,276 words and can be read in about 15 minutes. A recording of Welty reading her story on YouTube. An excellent film adaptations (with most of the dialog taken right from the story) available from FMG Films on Demand (Regent login credentials required). So you have no excuse to miss this opportunity in literature appreciation! This entry was posted in Special Events and tagged a worn path, Book Club, eudora welty, michael crews, short story on December 5, 2018 by Harold Henkel.